Johnson’s historical fiction trilogy begins in early 20th century Newfoundland incorporating features of pre-Confederation lifestyle, one well documented trend being the employment ofyoung outport girls as maids and cooks for rich families in St. John’s and the Boston States. Hannah Parsons, from fictional Falcon Cove on the Northeast Coast, is one such worker for wefirst met her on the eve of leaving the hamlet in From a Good Home. She had procured a position as a” serving girl” in the home of Virginia and Charles Sinclair, rich St John’s business people. 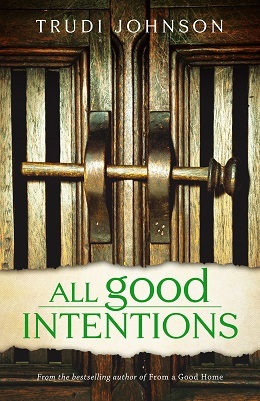 Ironically, as the sequel, All Good Intentions, gets underway, the road leads back to Falcon Cove as Hannah’s daughter, Jeanne Sinclair drives there to reconnect with her birth mother. A lifetime of scandal, societal tensions and shifting mores lie in between and the narrative hopscotches among time periods. As these unfurl, Johnson uses Book Two to further develop Hannah’s personality. With her former co-worker. 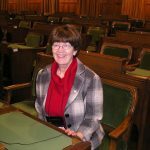 Alva Green, she relives the painful memories of leaving her infant daughter behind in St. John’s with Virginia Sinclair in 1937. Adding developer, Kevin Gillis, is an impetus to keep the Sinclair saga alive for the reader. Sexual tension, jealousies and intergenerational jousting, continue to be by-products. Kevin brings out a softer Jeanne, but his pursuit exposes her still unresolved feelings for ex-husband, Kurt. Cultural authenticity continues: icebergs, knitting, church meetings, Nestle’s cream, a delayed Spring, along with the dialog itself. Hannah’s friend, Adelia, interjects, “What’s wrong, maid?” Point of view continues to switch often, as in Book One. Familiar stock characters: nosy Lindsay Martel, whiny half sister, Emily, principled half sister, Rev. Carrie remain, bringing conflict in their wake. Of course, nothing is as it seems behind the imposing door handles that adorn both books. As layers of secrets are peeled away through the frequent flashbacks in Book Two, we encounter more and more victims. Social blackmail, stolen inheritances, economic wrongs could all be symbolized by the bolted entrance on the jacket of All Good Intentions Johnson shines a light of remembrance on prior events that affect the present, especially the tangled ownership of Sinclair House. Frequently characters like Kevin, Emily and Sinclair lawyer,Jonathan Hamlyn, use near gaslighting techniques to lead Jeanne astray. Yet Jeanne herself is not above deceptive motives and techniques. Trudi Johnson has mined her family’s roots and home town to create pleasant, entertaining fiction, while tethering her plot to real places and happenings. Her in-depth knowledge of St. John’s is displayed through locations, street names and her characters’ homes. While Johnson’s heroine, Jeanne, has been reared in a genteel environment in St. John’s, descriptions of her mother’s life ring true from the fictitious Falcon Cove left behind. Both novels laud women’s achievements. Once the secret of Jeanne’s birth scandal is released, she experiences an emotional catharsis and connects to her birth family. Indeed, issues such as workplace freedom, inconvenient pregnancy, male aggression, forging identity, are everywhere in Johnson’s works. In All Good Intentions, the plot responds to Hannah’s being “in service “and Charles Sinclair’s Will, as introduced in Book One. Property ownership continues to provide complications. Indeed, Sinclair (Boland) house, mirrors Downton Abbey, becoming itself a major character. Charles Sinclair, like Shakespeare’s Caesar, influences events, long after his earlier departure. Adding the list of family members and minor characters at the outset acts as a refresher for returning readers while frequent flashbacks make it possible to read All Good Intentions as a stand alone novel. Johnson’s style, packed with dense detail and intense description, risks obscuring events. Yet it has visual power, as with her description of toutons on Joe’s plate in the Planter’s Bight café. All in all, the canvas remains crowded, with details and characters. With so much name authenticity, it is odd how Memorial University is identified only once. (in Book One). Conflict for the threequel is hinted. Brittany Kavanagh will manage the Sinclair House and could turn into a threat to Joe and Sandi’s marriage. Carrie has some undisclosed facts she is keeping from her mother and sister. Alva may still be guardinghurtful secrets. Jeanne pronounces early on, “the hardest thing about life is that it ends.” for she and Kevin struggle with the loss of their fathersand the puzzles surrounding their entangled legacy. Details,hidden by Clarence Boland to cover his own illegalities providemystery and heartache for two families. Through joys and sorrows, Newfoundland history is brought to life!